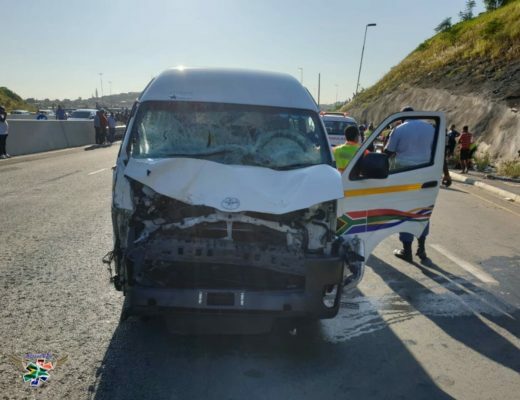 The taxi which was involved in the accident in Durban in which three schoolgirls died, 6 March 2019. Picture: Rising Sun Overport. The Road Traffic Management Corporation (RTMC) tonight welcomed the arrest of a driver who was behind the wheel of a taxi when it collided with and killed three schoolgirls in the Newlands East area of Durban. “The RTMC commends the police for their quick response and ensuring that this driver is held accountable for his irresponsible and unacceptable conduct that is not in-line with the principles of the Road Traffic Act,” said RTMC spokesperson Simon Zwane. The RTMC called on prosecutors to oppose bail for the 33-year-old and ensure that the driver “remains in custody for at least seven days”. “The courts should give him the harshest punishment possible, including the cancellation of his driving licence,” said Zwane. It is alleged that the driver skipped a red traffic light before colliding with the girls, who were on their way to school. A fourth girl is in critical condition in hospital. The man will likely face three charges of culpable homicide and is set to appear in court this week.